While many of you barbecue purists don’t consider ‘cue from south of the border or news from north of it, this New York Times piece on S.C. ‘cue combines the two. More specifically, it’s about Scott’s Variety Store and Bar-B-Q in Hemingway, S.C.
Now I know what some of you are thinking: Oy! But before you click away, know that John T. Edge, author of the fabulous Southern Belly and director of the Southern Foodways Alliance, wrote the article. In my book, that alone makes it worth reading. The piece and the awesome, accompanying audio slide show really capture the atmosphere and color of slow-cooking swine. While there’s no mention of that palmetto state sacrilege–mustard in the dip–there is some MSG, unfortunately. But did you see that wood pile?! Locals knew that if they dawdled until the serving table ran low, Jackie Gordon, Rodney Scott’s aunt, would break down another pig on the bone table. They knew that, with a little luck, they might score a rack of spareribs, wrenched hot from a carcass. True to my name, I’d dawdle as long as it took to get some piping hot ribs. Anyway, have a great weekend. And if you’re driving down to Hemingway, holler. The NYTimes article didn’t make mention of a mustard bbq sauce because Hemingway is located in an area of the state of South Carolina that doesn’t default to mustard. 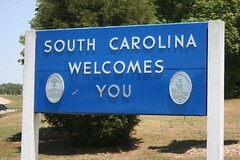 The area of SC directly below eastern North Carolina is known as vinegar/pepper territory. Vinegar sauce is prevalent all the way down to Charleston and a good ways inland. Similarly, western NC (Lexington style) sauce crosses the border into SC the same as eastern style. Mustard, in SC, is a “Midlands” sauce and migrated toward Charleston and down toward Beaufort. While you’ll likely find mustard sauce here and there across the entire state of SC, it isn’t the only sauce in the state. Much like NC’s two distinct regions (Eastern style & Lexington style), SC actually has four regions that are heavily compromised by four distinct sauce types (light tomato [Lexington style], vinegar & pepper [Eastern NC style], heavy tomato, and the ubiquitous mustard). So many people equate South Carolina bbq with mustard because this style of sauce is unique to the state. In reality, mustard is only a small part of the SC bbq equation. Thanks, Jay. That’s more knowledge on SC sauce than I ever want to know. Kidding! Thanks for the informative comment. I just want to know why Texas Roadhouse doesn’t serve Texas style BBQ which is beef. I don’t like pork. I was raised sort of kosher, not Jewish or Muslim style], about the only pork I ever ate was bacon and that was by accident. And I’m not particularly fond of chicken. I really like BBQ lamb. Shaslick style. So I’ve been looking for good beef BBQ ever since I moved to the Upstate. Where can I find it? Or do I have to make it myself? Blue, if you don’t like Eastern NC style (vinegar based) pork bbq, just stick to pizza or some other atrocity.